Feeder Soccer Under 13s are pictured before their 6-2 win over Riverside. From the left they are, back, Macy Jackson, Aaron Fearn, Shay Markham, Matt Jackson, Felix Chittock, Miles Morris, Ellis Mastin, Riley Taylor, front, Troy Peters, Jude Watson, Charlie Pywell, Jake Hardy, Jayden Kazimierow, Louis Peters and Damon Pywell. Feeder Soccer Under 12s sufferd a first Peterborough Junior Alliance League defeat of the season on Sunday. The Division One leaders were well beaten 4-0 by nearest challengers March Soccer School Blue, who have closed the gap on Feeder to four points with a game in hand. Riverside Under 13s are pictured before their 6-1 defeat by Feeder Soccer. From the left they are, back, Liam Coleman, Callum Ewers, Josh Duffy, Adam Darkin, Demi Sotanni, Luca Leone, Jack Walton, front, Gabriel Goymor, Jamie Moorehouse-Tupper, Harley Driscoll-Freeman, Daniel Richmond, Finlay Boothby and Joseph Reindel. Aidan Kirby, Luca Middleton, Frankee Satt and Tyler Powell were the March lads on target. Another March team doing well at Under 12 level are March Town Athletic. They are second in Division Four behind Boston after a 12-1 thumping of town rivals March Park Rangers. George Allen fired a treble with Harry Pluckrose and Shawn-Daniel Skelly hitting doubles. It’s also looking good for the March Soccer School Under 14 team. Action from tne game between Riverside FC Under 13s and Feeder Soccer Under 13s. 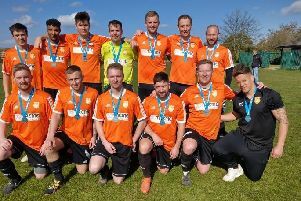 They’re leading the Division Two title race and on Sunday walloped Bourne Town 11-0. Daniel Cave grabbed five of the goals to take his tally for the season on to 30 from nine appearances. Not far behind Cave in the Under 14 goalscoring stakes is Netherton United’s Wayne Cort. He made it 28 in nine games with four goals in his side’s 8-0 win at Crowland. The victory keeps Netherton flying high at the top of the Division One table with a perfect sevens wins from seven games. They are three points clear of One Touch Football, who beat Holbeach 6-1. Peterborough Sports may be struggling at first team level, but their three Peterborough Youth League sides are flying. On Sunday the Under 15s, Under 16s and Under 18s all enjoyed fine wins. The Under 15s saw off main title rivals Werrington Athletic Blue 3-2 in a Division One top-of-the-table clash thanks to goals by Joelyn Cobb (2) and Zachary Hope. Sports now lead the way by two points with a perfect four wins out of four. Sports Under 16s also occupy top spot in Division One and they opened up a six-point lead with a 7-1 beating of Stamford. Bradley Gilbert (2), Callum Arden (2), Jazleigh Fife, Cameron Fox and Nasir Nabi were their players on target. The Under 18 Division One table also has a Sports team at the summit but on Sunday they were busy making Northants Cup progress. They won their second round tie 6-1 at Daventry Town Vikings with substitute Jordan Giddings smashing a hat-trick.